Hello! As I had mentioned in my previous DayZ post I wanted to start a DayZ diaries. 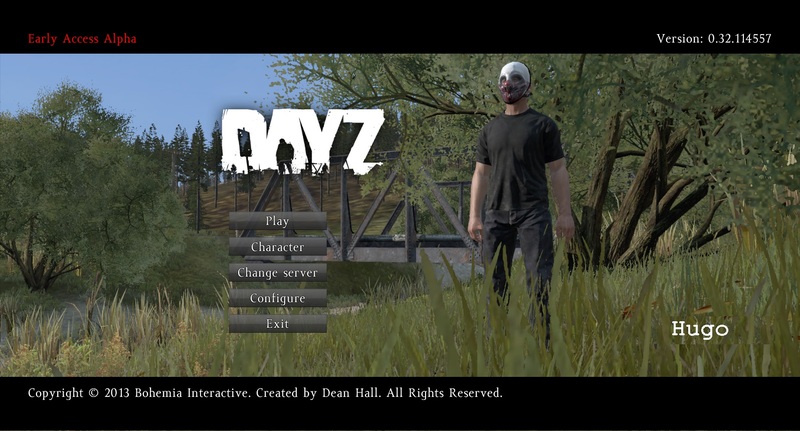 The premise will be to diary about one life in DayZ. That could go on for one post (lets hope not), or could go on for many. So without further ado, uhhh… here it is. My fresh new life has begun in Chernarus. The sun is sitting low in the sky, dusk is approaching. About 300 meters in front of me is a little cluster of houses, and the sea is on my right hand side. Judging by my surroundings, it looks like I’m on the east coast, however, that is all I can tell right now. I make my way to the nearby houses in search for some supplies. Priorities are a backpack, a weapon, and something to drink. I always need something to drink. “I’m thirsty” that’s all I ever hear from Hugo – Yea I’m calling my character Hugo, it’s like having a child on a long car journey, “Are we there yet? I’m Thirsty! I’m Hungry!” SHUT UP HUGO! I’m looking for supplies, be patient! Meet Hugo, fun loving, Chernarus rambler. GSOH. The first couple of houses have nothing, well apart from a rotten apple. That’s one of the things you have to get used to in the standalone. Loot now spawns every time the server refreshes, so if you miss it, there is a chance you will miss all the best loot. Oh well. Once done searching the houses, I notice a road sign that says “MCTA < 2”, that will be my next destination. Surely Mcta or, Msta as its sometimes referred to, would be a big enough town for some half decent supplies. I start to make my journey inland towards Msta. I stick close to the roads, but only close enough so I can still see where they head, and I don’t get lost. About half way between Msta and the last load of houses I come across a barn, and a little house. I head inside hoping for something, anything. I ascend the stairs on one side, nothing, look across to the other side, “Oh, is that a backpack over there?” I quickly make my way over, nope, just some jeans… Luckily there is a water pump just outside the barn, so I make sure Hugo gets nice and refreshed before getting back on the road. Another 200 yards along the road are another set of houses, Msta? I don’t think so, doesn’t look big enough. But still it’s a chance for looting. A quick search of all the houses leaves me with a canteen and a set of damaged bandages. But I’ve had to drop my torch and batteries to make room. As the canteen was only 40% full I head back to the water pump to fill it, and get Hugo another drink, just in case. My journey to Msta, is uneventful, and I make it there with ease. 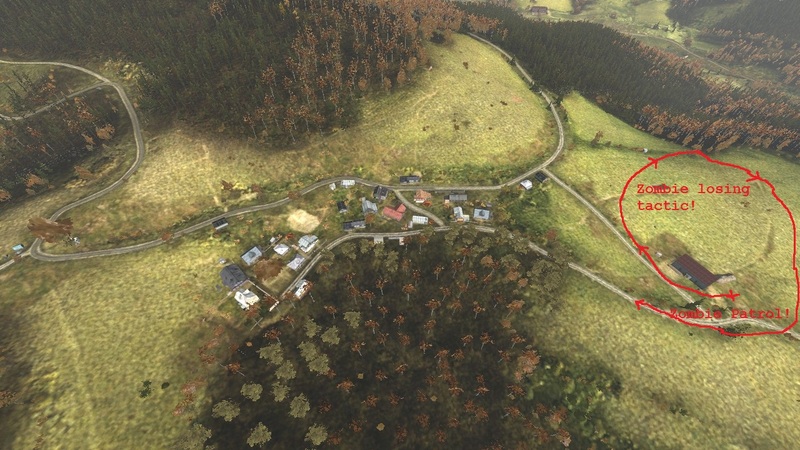 Its only when I get there, that I notice there is a zombie lurking on the outskirts. Patrol? Do zombies patrol? I think this one does, he looks ‘street smart’! I’m quickly proved correct as he soon notices me “Heeeayy!” he screams, well at least it sounds a bit like he said that! “Coooemmme Heearrree”. “No, get lost you stupid zombie.” I run back into the fields in a big loop to try and lure him away and lose him. My plan works masterfully! Msta is now mine to explore, well hopefully it is. Msta – No loot! Zombie patrols! Once I was done with Msta, I decided to check a map to see where I was, and what else was around. Staroye was about 1km to my west, that would be my next destination. Now I wasn’t aware of this, but it seems that zombies have access to some pretty advanced technology, because whilst checking the map, a zombie managed to teleport right next to me from god knows where. Who knew they were so smart? Personally I think we should try an collaborate with them, teleportation could be pretty useful! Anyway, this teleporting zombie was less interested in collaboration, and more interested with what my insides looked, and tasted like. She managed to hit me a few times before I could get away. Then the inevitable “My clothes feel damp with blood.” Message popped up, ewww. Luckily I still had my bandage from earlier. See dropping my torch was worth it! I quickly made my escape, and once at a safe distance I patched my wounds. I was now just outside of Msta on the West side, and decided this would be a good place to make camp for the night. Next it’s time to head to Staroye, what would await me there? Would I finally find some decent loot? A weapon at least, surely! How long will Hugo survive? Stay tuned to find out.